Every piece of the kitchen should be functional and that is twice as true with the cabinets. Cabinets take up more space than any other item in the kitchen and they are one of the most important features. If you place them too high or too low, you’ll notice. When choosing the right height, there are several factors to take into account. Before you decide what the right height is for your home, it’s good to look into the typical heights. The answer isn’t as cut and dry as you might like because it often depends on the cabinet style, the home, and the family that lives there. Past cabinets show that it is standard to install cabinets about 18 inches off the countertop, but it’s becoming more popular to hang cabinets a bit higher for more space, such as 20 inches or more. Eighteen inches off the counter is a good starting point and you will want your cabinets that high at the very least. That height will allow you to fit small appliances on the counter, beneath the cabinets, but it’s not a be-all and end-all height. You can raise the cabinets higher and there are many reasons to do so. Consider a higher level for your cabinets if any of the following are true. If you and your family members are taller, your line of sight is higher and cabinets that are average in height might look strange. It makes sense to raise them to a taller height to make your daily routine more convenient. If you have a modern backsplash in mind or an over the top kitchen hood, raising the cabinets allows you to open the space and balance things out while giving you a striking, untraditional feel in the room. Do you have a large, deep farmhouse sink? Is the pantry on the large side? If you have other kitchen features that tend to take over the room, putting the cabinets up farther, even 30 inches off the countertop, will give the space a balanced feel and allow you more maneuvering room. Kitchens need storage and you need everything to have its place to keep things functional. Cabinets are an essential storage room, but you might want some other storage options as well. If you raise the kitchen cabinets, you have more wall space for shelving, hanging pots and pans, and other similar options. Choosing kitchen cabinets isn’t something you do on a regular basis and it can be nerve-wracking to make such an important decision for the space. 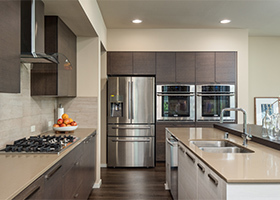 Ask the experts at Lampert Lumber your cabinet questions or reach out for kitchen design help. Your cabinets are something you’ll have to use and live with for as long as you’re in the house. You want them to be at just the right height!